Caibration Reagent for KH Guardian Pro. (Single Sachet). The KH Guardian reagent is a special concentrated formulation to ensure the accuracy of the testing and safety of the reagent that goes back into your aquarium. Dr. Bridge carefully selected a pharmaceutical grade reagent for purity and stability. 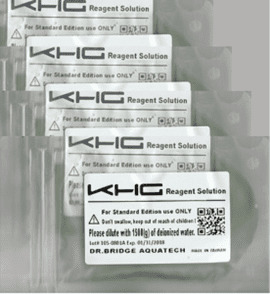 Each pack of concentrated KH reagent requires dilution with 1500 grams (+/- 1 gram) (please note that it is not ml) of pure water. The KHG reagent usage depends on testing frequency and the alkalinity of the water being tested. Typically, with an alkalinity of 7.5kH, the KHG will use approx. 2.2mls of reagent per measurement. With an alkalinity of 13kH, the KHG will use approx. 3.8mls of reagent per test. No preservatives are added to the concentrated KH reagent pack in order to protect the safety of living creatures in your reef aquarium. 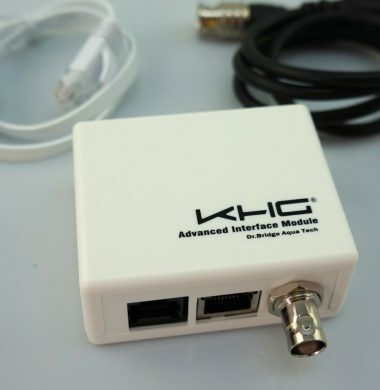 KH Guardian Alkalinity Interface Module (AIM), for the monitoring and testing of Alkalinity/Carbonate Hardness in Reef Aquaria through most Third Party Controller/Computer Systems. Calibration Reagent for KH Guardian. 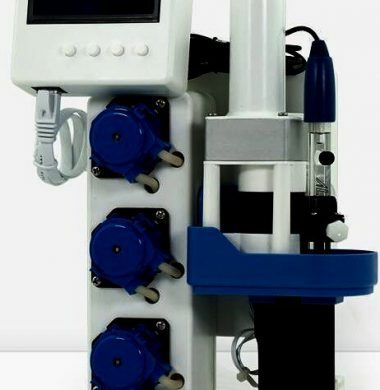 AUTOMATIC MONITORING AND CONTROL OF ALKALINITY IS NOW POSSIBLE! This is a MUST HAVE for all serious reef keepers. The KH Guardian is without doubt one of the most innovative, exciting and ultimate game changing reef aquarium products of this century, from the brilliant mind of Dr. Bridge.